To tell you the truth, my three and a half couldn’t care less. I’m not sure he is even cognizant of Halloween and the activities involved. I’m the one with the crisis. I make costumes for my kiddo every year although not necessarily for Halloween. 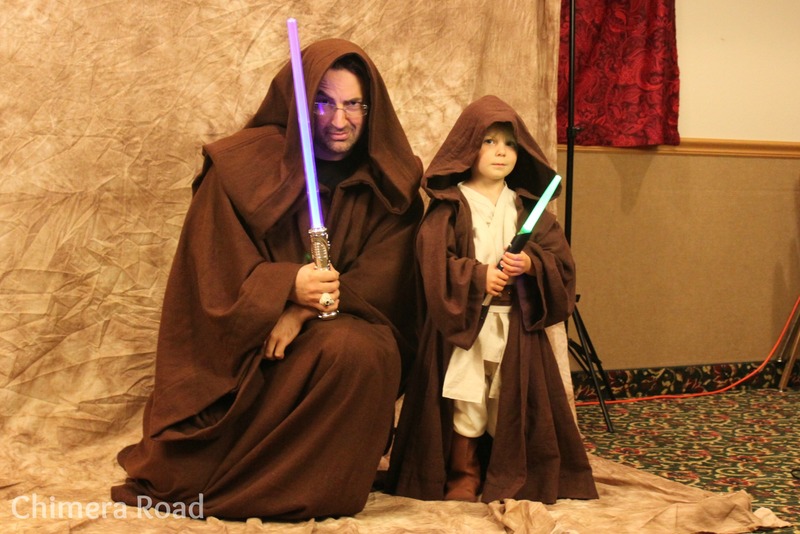 There’s an annual sci-fi/fantasy convention in our town… annnnd every year I make sure that Munchkin is dressed to compete with all the other outfits there. As one of the youngest attendees, he usually scores points for cuteness. This year he was a mini-Jedi knight. It was actually super cool, because the guy who plays the Star Wars character “Darth Malgus” for Lucas Arts was attending our little con this year. (He’s the only guy who officially cosplays him, actually.) 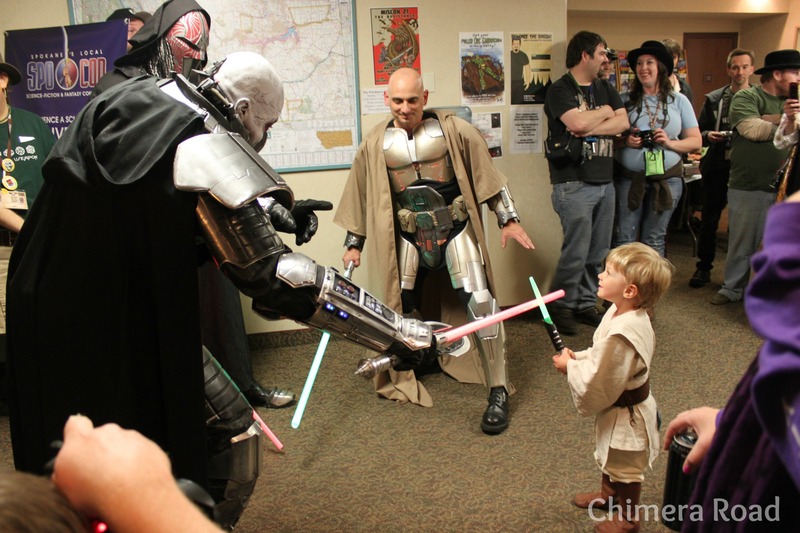 He and Munchkin and a couple other guys dressed up as Star Wars characters crossed lightsabers one night. Munchkin dueling with Darth Malgus, a Sith Lord, and an Old Republic Jedi Knight. It is immensely gratifying to have contributed to making that memory for Munchkin. (It wouldn’t have happened had he not been wearing the costume… that is what attracted their attention.) He’s still talking about it, nearly five months later. Heck, I’m still talking about it. Recently, the Engineer took Munchkin on a trip to Target. The Halloween costumes are out (along with the Thanksgiving stuff AND the Christmas stuff… what is UP with that?) and so they browsed and tried on masks, played with the swords, etc. Following that visit, Munchkin decided he wanted to be Darth Vader for Halloween. With his plastic, voice equipped mask. Ummmmm…. what about using your lovingly handcrafted lightsaber and wearing that Jedi outfit tailored especially for you? To be even MORE honest about this, I was feeling guilty that I wasn’t planning to make a new costume for him… even though the Jedi costume is more than adequate! Talk about beating myself up for nothing! He has just told me that he wants to be Robin Hood… with a bow and arrow… I can’t decide if I should just let that one pass or not… but it wouldn’t be a difficult costume, and we can add it to his (already overflowing) costuming trunk. Let the sewing commence! I’m SOOO envious that you can make costumes! I have a sewing machine at home that is a dust collector. I don’t know how to use it and plan on taking classes soon. Those are great outfits and loved the pictures!